The Mercedes-Benz E-Class Cabriolet has made its public debut at Geneva, completing the renewal of the manufacturer's cabriolet line-up. Sister model to the recently unveiled 2017 E-Class Coupé, the new four-seat drop-top will go on sale in Britain later this year. The new E-Class Cabriolet slots into the German car maker’s line-up between the recently launched C-Class Cabriolet and larger S-Class Cabriolet, providing Mercedes-Benz with a formidable open-top line-up that is further complimented by its existing trio of roadsters: the SLC, SL and GT Roadster. The 2017-model-year E-Class Cabriolet has been thoroughly re-engineered and shares little with the seven-year-old model it replaces. Among its key developments is a new high strength steel and cast aluminium body structure featuring stiffening measures aimed at providing it with a level of rigidity on par with the E-Class Coupé. To keep weight in check, its outer body also receives fenders, bonnet and bootlid made of aluminium. There are no surprises with the styling of Mercedes-Benz’s latest cabriolet model, with the E-Class Cabriolet leaning heavily on the appearance of the latest E-Class Coupé. The mechanical identical duo are the first models to feature a new restrained design lineage introduced by Mercedes-Benz design boss Gorden Wagener. It does away with the heavily structured look that characterised its predecessor for a more cohesive look that does away with deeply etched side feature lines in favour of smoother forms aimed at providing a more 'timeless visual'. The automatically operated fabric roof of the new E-Class Cabriolet is similar in design to the closely related structures used by the smaller C-Class Cabriolet and larger S-Class Cabriolet and comes in four colours: brown, blue, red and black. The multi-layer roof, produced by Austrian based engineering specialist Magna, can be opened and closed in 20sec while the car is travelling at speeds up to 50km/h via a button on the centre console, stowing in a dedicated space underneath a tonneau cover at the rear of the cabin to preserve the new convertible's svelte lines. The nominal boot capacity of 385 litres is reduced to 310 litres when the roof is stowed. This is 10 litres more than that offered by the old E-Class Cabriolet, while new 50/50 split-folding rear seat backrests allow the stowage of lengthy items such as skis and golf bags when the rear seats are unoccupied. At 4826mm in length, 1860mm in width and 1428mm in height, the new E-Class Cabriolet is 123mm longer, 74mm wider and 30mm higher than its predecessor. Based on Mercedes-Benz’s MRA (modular rear architecture) platform, it also receives a wheelbase which is 113mm longer than before at 2873mm. The track widths are also increased by 67mm at the front at 1605mm and 68mm at the rear at 1609mm. The new E-Class Cabriolet has the same interior as the latest E-Class Coupé. While heavily based on that used by the E-Class Saloon, it receives a number of exclusive touches, including newly designed turbine style air vents within the dashboard facia, automatically extending feeder arms for the front seatbelts, exclusive open pore wood trims and what Mercedes-Benz describes as special heat-reflecting leather in five different colours. The new open top comes as standard with analogue instruments and an 8.4in infotainment monitor, although buyers can choose two optional 12.3in digital displays like those already offered on the E-Class Saloon. The operating control for the optional digital displays is via small touchpads on the horizontal spokes of the steering wheel or a rotary controller and larger touchpad within the centre console and, as a further option, speech commands. 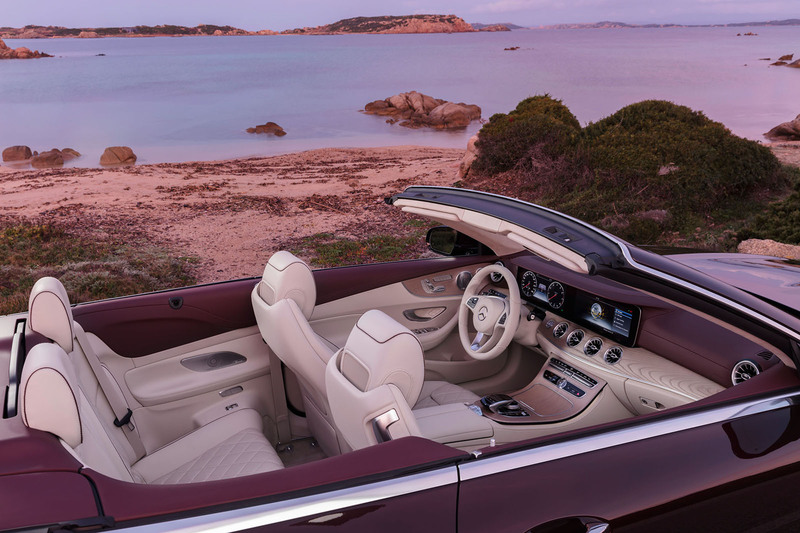 As with its predecessor, the new open top can also be optioned with Mercedes-Benz’s Aircap draught-mitigating system incorporated within the upper section of the windscreen header rail and the Airscarf neck heating ventilation system integrated into the front seat backs. The larger footprint translates to increased interior accommodation, making the new E-Class Cabriolet a proper four-seater; headroom is up by 15mm up front and 6mm at the rear, shoulder room is increased by 50mm at the front and 14mm at the rear and elbow room grows by 38mm front and 20mm rear. The largest increase in interior space, though, is reserved for rear seat legroom, which is up by 102mm at a claimed 866mm. Among the occupant safety measures offered by the new Mercedes-Benz model are five standard fit airbags, including a knee airbag for the driver, as well as four optional airbags, including side airbags in the rear. Further protection is provided by two sturdy beams integrated into the rear bulkhead. They are pyrotechnically fired out through the rear trim panel when sensors detect a possible rollover to create added survival space. The E-Class Cabriolet is planned to be offered with the same engine line-up as the latest E-Class Coupé, alongside which it is produced at Mercedes-Benz’s plant in Bremen, Germany, with three petrols and a single diesel powerplant ranging in power from 181bhp to 328bhp. The petrol line-up starts with E 200 Cabriolet powered by a turbocharged 2.0-litre four-cylinder engine with 181bhp. It is joined by the E 300 Cabriolet running the same turbocharged 2.0-litre four-cylinder as the E 200 Cabriolet tuned to a 242bhp. 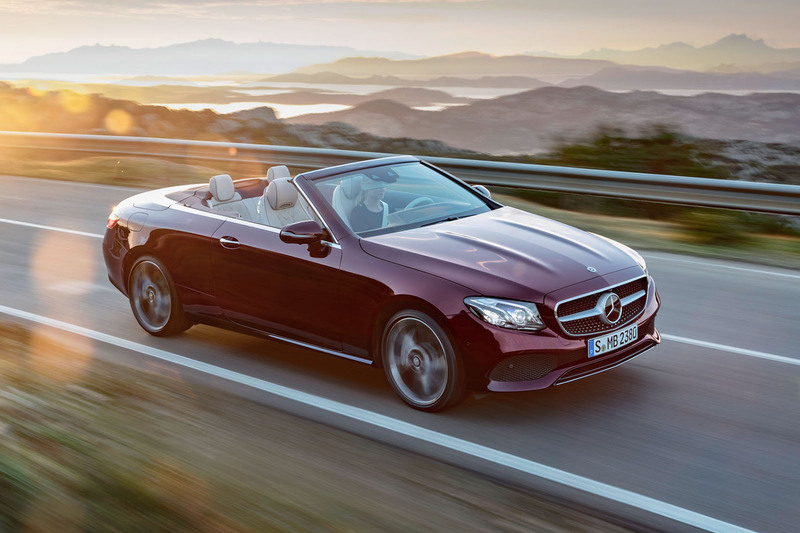 Above it sits the E 400 4Matic Cabriolet, which uses a twin-turbocharged 3.0-litre V6 engine delivering 328bhp. The sole diesel in the initial UK line-up, the E 220 d Cabriolet, runs Mercedes-Benz‘s newly developed turbocharged 2.0-litre four-cylinder diesel engine with 191bhp. All models come fitted as standard with Mercedes-Benz’s nine-speed automatic gearbox. The E 220 d Cabriolet and E 300 Cabriolet are rear-wheel drive, while the E400 4Matic, as its name suggests, comes as standard with Mercedes’ four-wheel drive system, which provides a nominal 45% front, 55% rear apportioning of drive. As with the latest E-Class Coupé, the E-Class Cabriolet's suspension is lowered by 15mm over that of the E-Class Saloon and comes in combination with wheels range in size from 17 to 20in depending on the engine and styling package. Buyers can choose between three different suspension set-ups: a base steel-sprung Direct Control system, a steel-sprung Dynamic Body Control system with adaptive damping and an Air Body Control system with multi-chamber air springs. In combination with the Dynamic Body Control and Air Body Control suspension, the E-Class Cabriolet also gets Mercedes-Benz’s Dynamic Select system, which allows the driver to alter the characteristics of the car between five modes: Eco, Comfort, Sport, Sport Plus and Individual. In celebration of the 25th anniversary of the first E-Class Cabriolet, Mercedes-Benz has announced a special 25th Anniversary Edition of the new model with either a red metallic or silver exterior paint scheme in combination with a red roof, 20in wheels and a beige and red interior, among other high-end features. Looks great inside but as I've found since purchasing the new model E class saloon the press photos of the interior are of extremely highly species cars. The dash doesn't come covered in leatherette, it's an extra and only available on AMG trim line cars. Also the lovely diamond quilted Napa leather seats cost several thousand pounds extra. Why don't they ever show a standard, without lots of optional extras fitted, interior. Seems like we're showed champagne but it comes as lemonade as "that's an extra sir". Mercedes benz E-Class Cabriolet is one of the best luxury cars in its segment. The features explained in this blog, themselves speak about this car. Being a mercedes customer, I too have bought mercedes C-200 from Mercedes dealers ahmedabad - www.benchmarkcars.in . I'm very happy with the car performance and dealer services. I would like to replace my car with this car.